What Happens in Vagus Stays in Vagus – Unless You Breathe Differently: A Neurophysiological View of the Vagus Nerve, Trauma and Recovery through the Lens of Modern Spirituality , Tuesday, 10-29-19 (Live Webinar) « CE You! Explore the neurophysiological side of mental health with Rev. 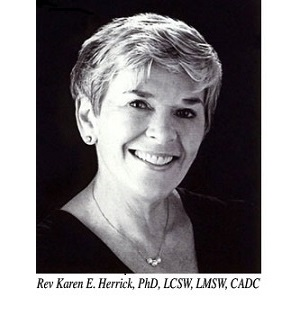 Dr. Karen Herrick, PhD., LCSW, LMSW, CADC. Participants will gain an overview of repressed trauma in the body and how these repressed memories trigger fearful behaviors in clients, the neurophysiological processes of the body and the reactions clients have to other people and their environment, theories of James, Jung, Maslow and Grof, and the differences between Spiritual Experiences and psychotic hallucinations. Since 1995, her Interfaith ministry has been actively involved in Spiritual Psychology, specifically in naming spiritual experiences and working with chronic grief. This has led her to studying the bidirectional system of the vagus nerve. While physically important, it is also through this nerve that we receive intuitive and spiritual messages.